We recently sat down to chat with the incredible Linda Howard who gave us some incredible tips for LA Brides! Here is Part 2 of the interview. What should a Los Angeles bride be conscious of when planning her wedding? Los Angeles is very deceiving in regards to weather. The “June Bride” is often disappointed if they are envisioning a sunny, summer day. If my bride is wanting to have an outside, garden wedding, then July, August, September and October are the safest months. Any other month, I always suggest finding a venue that offers a “B” plan, so we can bring the ceremony inside if it is necessary. Where do you seek inspiration for designing events? From my background and love of design and shopping, my eyes are always open. I am constantly buying design magazines and books and pulling colors and styles of the newest trends. From traditional, to contemporary and sleek, to storybook and bling, I love creating and imagining the details that capture “the look” that the bride is wanting and envisioning. I never stop thinking of new ways to create a reaction from the guests. Floral displays in hotels and restaurants are a wonderful source of inspiration and wherever I go, my camera is always with me. What is the most unique event feature you personally loved from one of your past clients? For one of my weddings we created a waterfall backdrop for behind the stage. The lighting reflected on the wall, making it sparkle and flow. The color began as a shimmering diamond effect and throughout the evening the water wall changed into turquoise, lavender and then to hot pink! It was truly a show-stopper! We also created an entire ceiling of suspended ribbons with crystals to hang over the dance floor to create a magical and “bling” setting. What is your favorite part of working as a wedding planner in Los Angeles? I feel so fortunate to be able to create “dream weddings” for wonderful and appreciative people. My brides and grooms become very special to me and after planning their most meaningful and joyous day. There are so many wonderful options in Los Angeles and truly, the sky is the limit. Any idea is possible and no matter what I dream up— it can become a reality. Any other tips for an LA Bride? Don’t forget about LA Traffic! Long distances and traffic are a challenge when planning a wedding weekend celebration in Los Angeles. 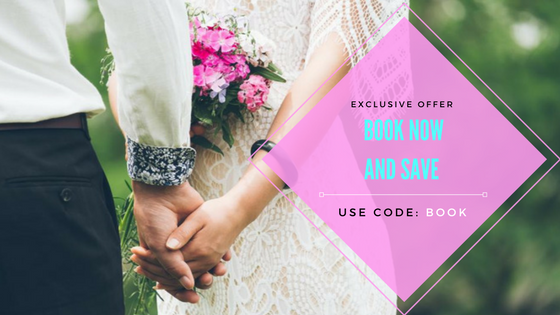 I always suggest selecting 3 hotels in various price ranges and in close proximity to one another, so that we can offer transportation to and from the wedding site.